Attention, Batman Fans! There is a campaign to get TVs original Batman, Adam West to host Saturday Night live. It worked for Betty White, why not Adam West? Production will be beginning on the next season of SNL soon. 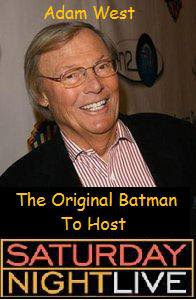 So hop to it and vote on the Adam West to Host SNL Facebook page. Let's get the original Caped Crusader to utter those words spoken at 11:30 on Saturday nights, "Live from New York, it's Saturday night!" Very cool. Thanks for sharing. Come on everybody, let's get Adam West on SNL.